It is the 6th day of Copa America Centenario and last night, soccer fans finally got what they were expecting: 2 very entertaining games. Colombia declared itself victorious at the Rose Bowl Stadium in Pasadena, California, against Paraguay, which did not deliver what people was expecting. Doing honors to the Soldier Field Stadium, a very uneven war unleashed as the United States obliterated Costa Rica’s eleven with a score of 4–0. Moreover, the results of both matches reflect what we published a couple of days ago about the selections of Paraguay and Costa Rica. Apparently, the Costa Rican team brought the same strategy they used in their match with Paraguay. However, this time, they faced a very motivated opponent, the United States’ eleven. After losing the first game of the tournament in their backyard, the U.S. team wanted redemption, and there was a lot of that. 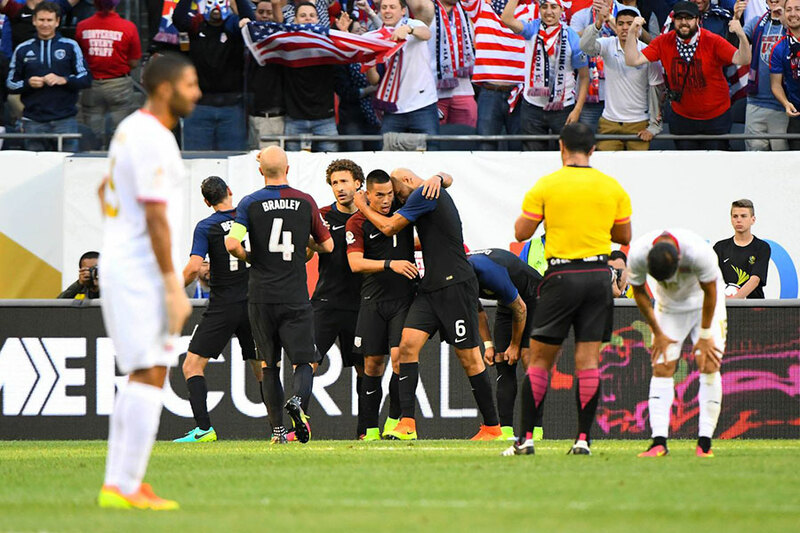 Clint Dempsey opened the score for the North American selection at minute 9 and Jermaine Jones, the man of the match, gave his team a comfortable advantage by scoring at minute 37. But that was not enough. Bobby Wood pierced Patrick Pemberton’s defense before the first half which ended with a score of 3–0 for the locals. The United States’ offensive was unstoppable, even though Costa Rica had more possession of the ball. It was the local team that seized the opportunities. Graham Suzi gave the coup the grace at minute 87 leaving the final score 4–0. The Latin American team showed vital faults at coordination with almost 10% incorrect passes, reflected by the 31 steals the “Americans” pulled out. The situation at the Rose Bowl Stadium was very different. The two teams struggled to the end, but the Colombian wall around David Ospina’s arch was too much of an obstacle for the Paraguayan team that lost a man due to a red card on Oscar Romero. Even though the team from Paraguay changed tactics and left it all on the field, it just wasn’t its day. Colombian fans gasped in horror as Dario Lezcano got in position and shot towards the archery, but they were immediately relieved as the ball crashed into the crossbar. The goalkeeper had had no action until then, and the Colombian defense got tighter. Carlos Bacca opened the score at minute 12 for the 1-0 for the land of the coffee and the man of the match, James Rodriguez, gave the final blow at minute 30. Even after that, the Colombians did not stop looking for more goals and they almost got a third at minute 69. Paraguay’s eleven looked much livelier in this opportunity, and after trying very hard, Victor Ayala scored at minute 71. However, it’s hard to overcome a full defense with ten men, and they ultimately lost. Paraguayan coach, Ramon Diaz, changed a couple of things, and it almost works. He faced the Colombians with more aggressive tactics and new blood, as Miguel Almiron, 22, debuted on an international stage yesterday.